This page is basically an information page about the process involved in adapting a throttlebody (TB) from a 1986-1993 Ford Mustang or an equivalent aftermarket piece (BBK, Edelbrock, or Ford Motorsport) to the upper intake of a 1986 - 19?? 2.9L Ranger V-6. This sheet is not intended as a step by step instruction page, as I hope you are at least semi-mechanically inclined to even attempt this swap. It is not what I would call a "bolt-on" modification, (I save that term for stuff like windshield wiper wings, cheesy stuff manufactured by Ralley, and the like) but with the parts I manufacture, it is as close as it can get. In the pics you will see that I also added the parts to my truck to convert over to a 1990 2.9L MAF computer. I also relocated my battery and installed an airbox from an '87 Aerostar. These additions are completely optional are NOT a requirement of this conversion. Incidentally, I ran the truck for 6 months with the stock (1986) MAP computer without any problems whatsoever while waiting to collect all the parts for the MAF conversion. 11) Section of 3/8" vacuum hose. 14) Provision for connecting TB to an air filtration system. (i.e. 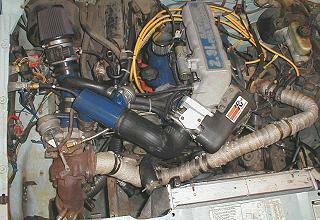 Airbox hose or K&N filter) The stock Ranger hose will fit as I have recently discovered. It is a tight fit, but should loosen up as time goes by. New pics of the revision will come soon. A. Rotating the hose bung to where it points down when installed on the truck. (180°) I accomplished this by simply using a large crescent wrench and the bung easily rotated in the casting. B. Plugging the idle hole in the throttle plate. This is a mod that I do not think is necessary now. I did this when I thought there was some kind of voodoo involved in setting the idle in EFI engines. If I had it to do again I would have left it alone. C. Removal of the stock ball stud on the throttle lever. This was harder than it sounds as the stud is friction-welded in. I ended up snapping the ball off and drilling the rest out. There is only one mod involved here and that is trimming a notch in the cover for throttle clearance. It will be obvious to you once you try to bolt the cover back on. 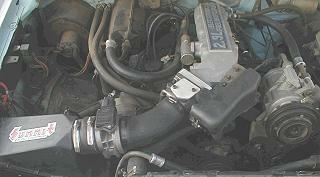 There is one mandatory mod and one optional mod to the upper intake manifold of the engine. A. The mandatory mod is the removal of a small portion of a rib near the EGR valve boss. This is required for clearance to install the lower TB bolt . I used my Dremel with a coarse sanding roll and is tool a few minutes. The same results can be had by using a rat-tailed file if a Dremel is not available. B. The optional mod is the matching of the adapter plate to the upper intake manifold. This should be done with the upper intake removed of course. Currently, mine is not matched and it really runs good. I have a spare upper that I am porting and matching and will install at a later date. The hole in the plate is large enough to support a 65 mm TB should you like to go that large. The Ranger upper can be matched with a 2" sanding drum mounted in an electric drill with coarse paper to start with. I matched mine in one afternoon. The intake can be tapered to match quite nicely, but care should always be taken to not go too nuts and grind through the casting. An easy way to match the new gaskets to the larger holes is to bolt everything together and trim them out with an Exacto knife or, like me, my Dremel. DON'T TRY TO PUT THE IAC ON THE MUSTANG TB INSTEAD OF THE RANGER'S UPPER INTAKE. IT WILL HIT THE HOOD. That comes from experience and a nice little outward dink in my hood. The Idle Air Controller for the Ranger requires a hose which must be attached to the hose bung on the Mustang TB. 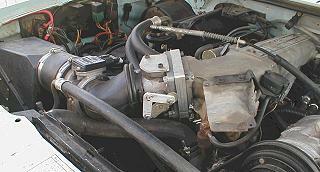 The Ranger, however, utilizes 2 bungs that feed the IAC and the driver's side valve cover vent. If you are installing this on a MAP EFI Ranger (stock except California 1990 model), you can use the supplied hose and T-fitting to connect both the IAC and the valve cover vent to the single bung on the Mustang TB. If you have a 1990 California model Ranger OR have converted your truck to MAF (like I am doing using Bob Marrs' instructions at Kunz Korner or the MAF conversion you must hook the valve cover vent to an independent source of filtered air. The reason for this is that the MAF meter measures how much air is entering the engine and calculates the required amount of fuel. By allowing unmetered air (like through the valve cover vent) into the intake tract down stream of the meter, the computer will not calculate the correct values and the truck will run lean. Supposedly, the computer will eventually figure this out and compensate, but I would rather have all my ducks in a row to start with and not have that thought lingering in the back of my head. If you have questions, or comments about this conversion, I can be reached at jpringle@1s.net. I hope everything goes well with your installation. I will have pics of the revised intake soon - no more Crown Vic elbow required! Make sure to check back soon.